Electronic Media and Journalism students submitted entries for writing, production and videography projects. Six Milton Hershey School® students were recognized by the Mid-Atlantic Region of The National Academy of Television Arts and Sciences (NATAS) for the High School Student Emmy Awards for Excellence. 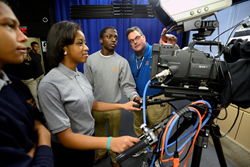 Students who participate in the school’s Electronic Media and Journalism career pathway submitted a total of 30 entries to the awards competition. Sophomore Lanae Dancy was nominated and awarded an Emmy in the writing category. The High School Student Emmy Awards are open to all high school students in the Mid-Atlantic region. NATAS received entries for the 2016 competition from students who are involved in school-wide newscasts, programs and productions. Entry categories included Newscast, General Assignment Report, Team Coverage, Arts Program, Sportscast, Musical Composition, Directing, Graphic Arts, Writing and more. Milton Hershey School’s renowned Career and Technical Education program gives students the opportunity to explore career options and accelerates their growth through hands-on instruction, workplace learning and certifications. In the last three years, 100 percent of graduating seniors earned at least one industry-recognized certification in his or her area of study. More information about Milton Hershey School’s Career and Technical Education program can be found at mhskids.org.